Walking down the street on Monday, July 29th, in the sunshine I came across a new piece of artwork on Juneau’s newly remodeled Main Street. 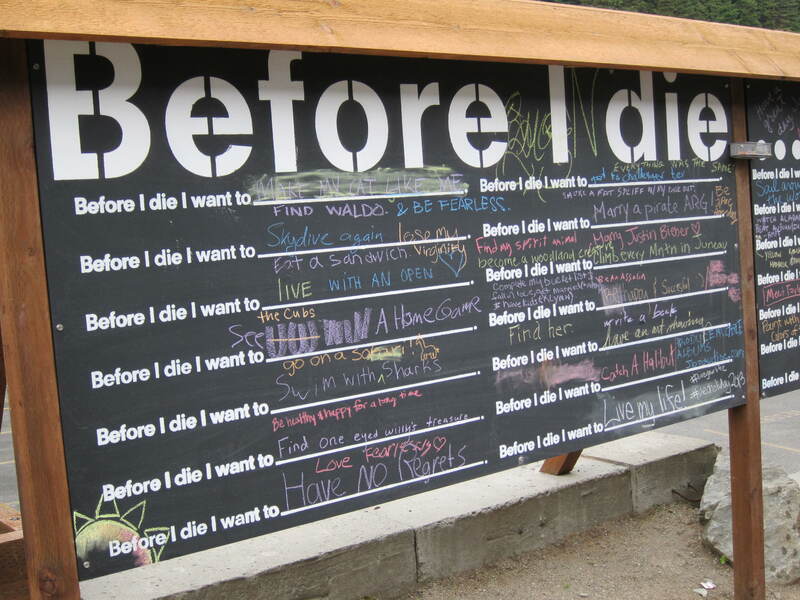 It’s a giant blackboard with the words “Before I die I want to . . .” written on it in big block letters. Below, there are several columns of blank lines for passersby to write their own reflections. Earlier this summer I watched the movie Chariots of Fire for the first time in a long time. I love this movie and I was looking for some much-needed running inspiration. Over the past 4 years I’ve competed in the Klondike road relay the second weekend in September (“competed” is a little deceiving, “survived” is probably more accurate). The relay is divided into 10 legs ranging from 5.6 miles to 16 miles. I am not a natural runner. I first became inspired to try running during my junior year of high school after watching the aforementioned movie and realizing that to run you don’t need perfect form, speed or endurance, you just need to run (and then walk when your face begins to turn purple) and then run some more. When I run I don’t necessarily feel God’s pleasure. I usually feel like I’m slowly killing myself for the purpose of health. And quite opposite from the easy gait and beatific expression on Ian Charleson’s face (who portrays Liddell in the film) with his head back and mouth wide open (said to be a historic representation of how the real Eric Liddell ran), I think I usually look like I’m dying too. But when I hear the synthesizer soundtrack in my mind and picture the 1924 Olympic hopefuls running through the surf it reminds me that this simple act, done with joy, can be spiritual as well. Liddell’s passion to run for God, and the new artwork on Juneau’s main street, both ask the question, what is it that is uniquely yours to do in this world? Where do you feel God’s pleasure and how might you use that passion, that desire to build the Kingdom of God? As one respondent wrote down, “Before I die I want to figure out what I want to do before I die.” Contemplating this question could be the first step to greater awareness of how God might be calling us through our deepest desires.